What is National Mission for Enhanced Energy Efficiency? The energy efficiency of the India is the fifth lowest in the world which means that the GDP energy consumption ratio in India is very poor. Thus, India must work on the strategic plan for reducing the use of fossil fuels without compromising on growth and energy efficiency to compete with the energy hungry countries. In this article, we are giving the concept and initiatives plan of the National Mission for Enhanced Energy Efficiency, which is very useful for the UPSC-prelims, SSC, State Services, NDA, CDS, and Railways etc. The energy efficiency of the India is the fifth lowest in the world which means that the GDP energy consumption ratio in India is very poor. Thus, India must work on the strategic plan for reducing the use of fossil fuels without compromising on growth and energy efficiency to compete with the energy hungry countries. Therefore, the National Mission for Enhanced Energy Efficiency (NMEEE) is one of the strategic mission to reduce the energy intensity as well as the carbon intensity so that sustainable growth can be achieved. This is the powerful initiative of the Government of India in meeting the global challenge of climate change. 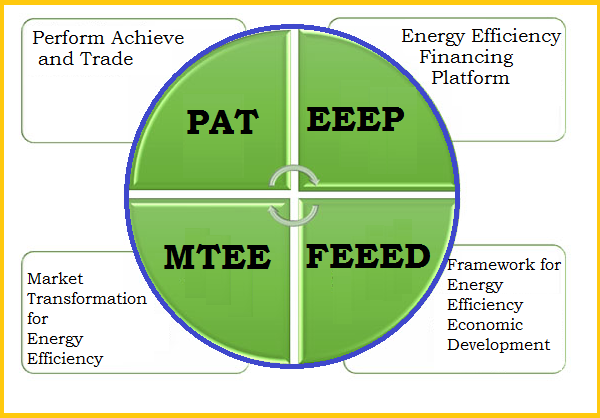 What is National Mission for Enhanced Energy Efficiency (NMEEE)? The National Mission for Enhanced Energy Efficiency (NMEEE) is one of the eight national missions under the National Action Plan on Climate Change (NAPCC). The prime objective of the mission is to strengthen the market for energy efficiency by creating conducive regulatory and policy regime and has envisaged fostering innovative and sustainable business models to the energy efficiency sector. By this mission government of India wanted to promote the market for energy efficiency by fostering innovative policies and effective market instruments. 1. Perform Achieve and Trade (PAT): Assigning energy reduction targets to large energy intensive industries and distributing Energy Saving Certificates (ESCerts) on achievement of the targets. These ESCerts can then be traded. 2. Energy Efficiency Financing Platform (EEFP): Increasing the confidence of financial institutions and investors to support energy efficiency initiatives. 3. Market Transformation for Energy Efficiency (MTEE): Promoting adoption of energy efficient equipment’s and appliances through innovative business models. 4. Framework for Energy Efficiency Economic Development (FEEED): Promoting energy efficiency initiatives by hedging against investment risks. Hence, we can say that the National Mission for Enhanced Energy Efficiency is a market-based approach to unlock energy efficiency opportunities. It is one of the eight missions under the comprehensive action plan on climate change related to the adaptation and mitigation. Do you know about the National Mission for A Green India?